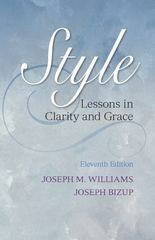 Style: Lessons in Clarity and Grace 11 Edition Engaging and direct, Style: Lessons in Clarity and Grace is the guidebook for anyone who wants to write well.Engaging and direct, Style: Lessons in Clarity and Grace is the guidebook for anyone who wants to write well. Williams’ own clear, accessible style models the kind of writing that audiences–both in college and after–will admire. The principles offered here help writers understand what readers expect and encourage writers to revise to meet those expectations more effectively. This book is all you need to understand the principles of effective writing.